35-year journey: Catechumens from Wynnum’s Neocatechumenal community join the Easter Vigil Mass in St Stephenís Cathedral. Brisbane Archbishop Mark Coleridge described “an extraordinary” faith journey of 35 years as he presented white baptismal garments to a Brisbane Catholic community completing its final catechumenal rite of passage during Easter. “It is a birth and every birth involves a death, and you have died to many things in order that you may be born,” Archbishop Coleridge said as he welcomed 42 members of the first Neocatechumenal community of Brisbane – from Guardian Angels parish, Wynnum – in St Stephen’s Chapel. 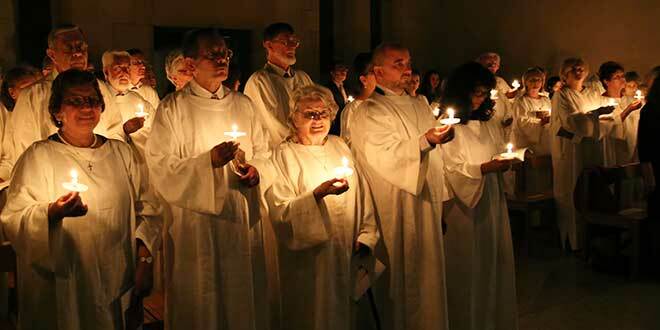 Archbishop Coleridge described wearing the linen baptismal garments as a sign of new life given by Christ. “You are God’s works of art as St Paul says, and you are a work of art that is given to us and to the world,” he said. Archbishop Coleridge revealed a long and close link with the catechists of the Neocatechumenal Way in Australia, Toto and Rita Piccolo, who were present as the white garments were presented. He met them when they first arrived as missionaries from Italy 40 years ago. At the time he was an assistant priest in the Melbourne parish of Ashburton. “It was impossible for them, and certainly for me to imagine we would be sitting here in the old cathedral of Brisbane … unimaginable,” he said, acknowledging Mr and Mrs Piccolo and Fr Tony Trafford who were accompanying the Wynnum parish community. “That has been an extraordinary journey – certainly for Toto and Rita, but also for me. Never in my wildest dreams would I have imagined I would be in Brisbane, let alone as archbishop – so the journey has been. Many adults entering the Church follow the Rite of Christian Initiation of Adults. It is a process of inquiry, a catechumenate – a journey of growth in faith, a purification and initiation – which in practice can take many forms. It can take months or years. For baptised or non-baptised people alike, the Neocatechumenal Way is a longer path to adult faith. “Conversion in the life of a person takes time,” Mr Piccolo said. “As society becomes more and more secularised the big gap, like a divorce, between the life of the people and their faith becomes more pronounced. “Many of these people were going to church years ago, but they were not living a Christian life. And to close this gap takes a serious way of conversion. 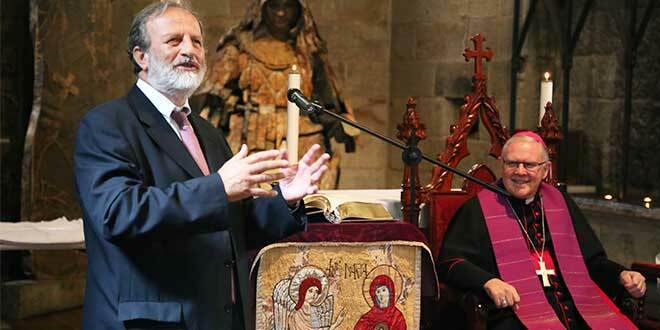 A long link: Neocatechumenal Way catechist Toto Piccolo and Archbishop Mark Coleridge met 40 years ago, when a young Father Coleridge was an assistant priest in Melbourne. The Capuchin friars who run Guardian Angels parish invited the catechists of the Neocatechumenal Way to start evangelising in Wynnum 35 years ago. The community contains an ethnic diversity of members from El Salvador, Chile, Sudan, Singapore and Britain, as well as Bayside locals. It also includes two priests. Mr Piccolo described members as “pioneers” who have spent many years listening to the kerygma, slowly being freed “from the idols of the world”, learning to pray and to profess their faith in Jesus Christ. “They had many wounds in their lives and did not know themselves well,” he said, reflecting on the long journey. “The Word of God and the catechesis they have received over the years have brought them solemnly to renew their baptismal promises in the Paschal Vigil. “God wanted this community to finish their Neocatechumenate in the cathedral with Archbishop Mark Coleridge. During the Easter Vigil in St Stephen’s Cathedral, Archbishop Coleridge welcomed and introduced the Wynnum Neocatechumenal community to the wider Catholic community. “I thank you, all of you – catechists over 40 years, priests, all those who have been part of the journey, all the brothers and sisters – I thank you for what you yourselves have done by being open to grace, the grace that has borne such fruit in you, and will certainly bear fruit at the heart of the Church and the rest of the world,” he said. The Neocatechumenal Way has about 70 communities in 13 dioceses across Australia.